Ignatius B. Grumply moves into the Victorian mansion at 43 Old Cemetery Road hoping to find some peace and quiet so he can crack a wicked case of writer's block. 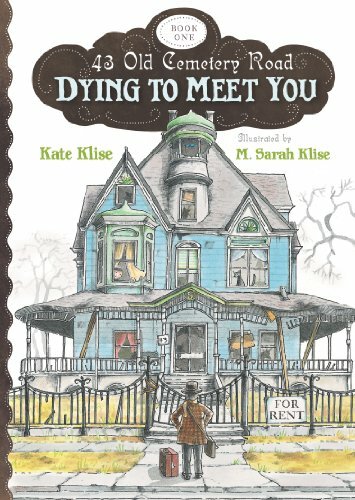 But 43 Old Cemetery Road is already occupied by eleven-year-old Seymour, his cat Shadow, and an irritable ghost named Olive. It's hard to say who is more outraged. But a grumpy old ghost just might inspire this grumpy old man--and the abandoned kid? Well, let's just say his last name's Hope. Sisters Kate and M. Sarah Klise, the creators of the award-winning Regarding the . . . series, offer up this debut volume in a clever epistolary series told in letters, drawings, newspaper articles, a work-in-progress manuscript, and even an occasional tombstone engraving. Trekkie1999 (Grade: B+) This is a children's book, but it's funny and addicting enough to be worth your while! Read it for a quick read!